This is for 2012 February's Vogue Latin America. The photographer is Jean-Francois Campos and the model is Constance Jablonski. Her wardrobe consists of Dolce & Gabbana, Prabal Gurung, and Jason Wu. Hair by Dennis Devoy. Makeup by Brigitte Reis Anderson. Fashion Editor is Sarah Gore Reeves. ...And this is my facial expression once the bill is tallied :) Have a great Tuesday everybody! I never dress up for the grocery store but this makes me feel like I SHOULD! I love the 3rd photo with the maxi dress especially! I love this post, I adore the dress in the vegetable section. Stay sweet. Love the colours in these photos. I love this photo series. She just looks so blasé about the whole thing. I think it would actually be fun to go to the market all dressed and glammed up lol. those pictures are awesome!!! i wish i can go to supermarket and be pretty like that hehehe. I think grocery shopping would be much funner if everyone was dressed like this! I don't dress THAT glam to grocery shop, but I sorda dress up everyday. I especially love the long light blue print dress, so pretty! It is a dreaded task I just went last night. I sometimes go right after work and with what I wear to work so I may get looks depending on what clothes and shoes im wearing but I try to finish shopping right away. Haha I LOVE this! I work in a bank and like to overdress a little, so I have gone to the grocery store after work before. One of the employees complimented me and said that she loved to see that some people still dressed nicely (Little did she know the day before I had went there in some SUPER crappy sweats!)! I am allergic to grocery shopping Kim! Maybe if I dressed like that I might enjoy it!! i like the editorial but she looks a bit like a stepford wife... haha!!! Oh I Looooooooooooooooooooove grocery shopping and can spend hours browsing and thinkig of meals and dishes I could make. :) On the other hand, I don't really like clothes shopping and prefer doing it on-line. I can't get over how fun this is! I love the eggplant dress in the produce section. Amazing. What a great post! I did actually go to the supermarket today and put on my faux fur stole (mainly because it was so very cold here) but I did feel more glamorous than usual! Not nearly as ultra glamorous as these ladies though!! Love this spread, and it's great inspiration b/c I hate going to the market and often end up running in looking anything but glam! Kim! I think this is my favorite of your posts! I LOVE this editorial. Im sure you can guess why! I grocery shop A LOT. However, I wish I walked in looking like this! This is my fantasy grocery shopping experience! love the shots..and glad you named all those who are behind it..i remember we entered the grocery store once and we were on our way back from a day out..i felt i had too much on for grocery shopping..and so did the others staring a us..but i have seen quite a few hostel students who turn up there in style..so i don't feel uncomfortable doing a bit too much sometimes..
Well I've never dressed up like THAT to go to the store but I get some stares at mine if I even wear heels! Glad you found Lauren...isn't she the best?! great post! love this look: housewife in couture! Bahaaha!! That's funny. Yes, it is quite ridiculous how expensive groceries are getting! lol These photos are gorgeous! I'm totally with you Grocery shopping can feel like such a chore sometimes! On the other hand, when I go to this boutiquey grocery store I feel like it's such a treat. Gourmet cheese and oils...count me in! Oohh love the styling and clothes used in this shoot! I think dressing up to go grocery shopping is a great idea! It will take the mundanity and humdrum out of the task. Thanks for your super sweet comment hun. Made my day! Ooh I love LOVE this! I dress up even at home sometimes so why not for grocery shopping? your post always makes me smile! i am not very fond of the model's face, tho. too artificial with souless eyes..
wow! love the colors in the photos! would be nice to go shopping made up like that everyday. beautiful selection of photos! I like the bold prints and colors. 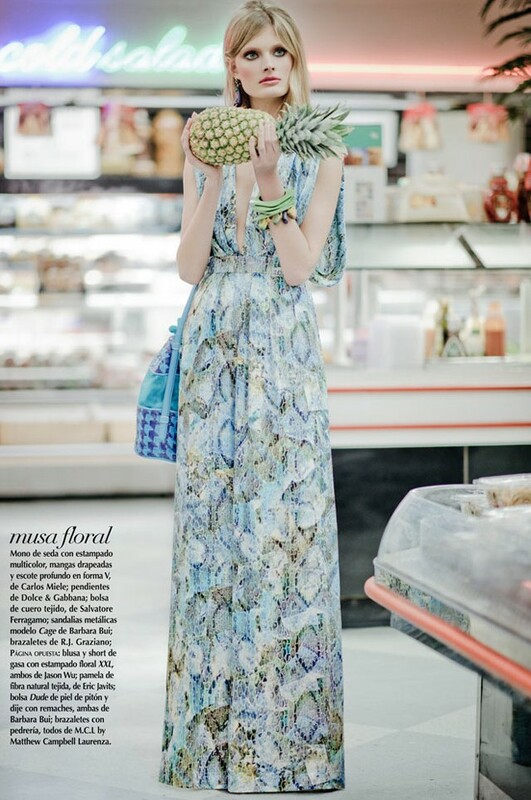 What a cool shoot, and really thought provoking given how most dress for the grocery store. Outside of the coffee shop and CVS, the grocery store is the only place I will go in workout clothes (can't believe I'm mentioning this on the internet!). Love that second to last picture, sooo lovely! I actually really love this set of photos. I have a dream of actually dressing up for everything now, so this provides actual visual inspiration! I usually dress up for the grocery store - but it;s because I go after work. I get stared at like an alien. With heels I am often 6'2ish and so that will get you stared at on it's own -but waltz into a small town grocery store in my funky ensembles you're sure to be the odd duck. Wow, this is an amazing post. I also dread grocery shopping but try to glam up whenever I leave my house because it just makes me feel so darn good! Thanks so much for stopping by. Let's follow each other! I never look this good at the store! I wish I did! Thnaks for sharing this lovely spread! I love the red bag, but what is the spiky thing hanging off it? This reminds me of photos I see of Dita von Teese going grocery shopping in some incredible vintage dresses and heels. omg i love this fashion shoot! its so cool! i've never gone THAT glam, but i have made a stop at the store on my way out (on the town), but don't think it comes close to these girls! gorgeous pieces here! and this morning...seriously..we had NO bread, NO lettuce for my lunch salad, and just enough milk for mini's lunch! hahah i love this editorial!! i think i use to go the grocery store full glam.. because i was single.. and you always imagine meeting a cute guy and asking him to grab something for you off a high shelf AHAHAHA but now that i'm married.. the hubs is lucky if i wash my hair and change out of my sweatpants BAHAHAHAH!! Wow I would love to look that stylish at the supermarket! I really like this editorial, very nice, the model is so incredible beautiful and the clothes are spot on; actually the whole styling is spot on! You have an awesome blog by the way and I am a new follower on GFC and Bloglovin! Hope you will like my blog and follow back! is that carolyn murphy? she looks like a mannequin! so perfect and stepford-wife-like! i must admit that i don't always look neat when i go to the grocery store. yes, i dread it sometimes... and if it weren't for the kids, i can survive on very little... but i do have to go for the sake of the kids... lol! Lookout Weekend! Prada is Haute! Hot! Haute!